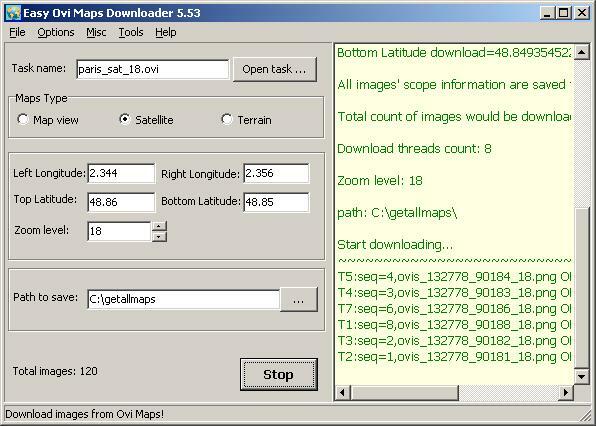 Easy Ovi Maps Downloader is a tool that can automatically download the Ovi Maps images to your PC. It can download the small tiles and save them to your hard disk, including the map, satellite and terrain layers. After downloading, you can view the maps offline by its tool Maps Viewer, or you can combine the small images into one big map image. If you want to make a map of your city by yourself, it is very useful for you. The output big image is in BMP format. You can convert it to other format by yourself using some image tools such like PhotoShop. And it will also create a World File. In menu "Options", you can set proxy infomation, then you can use your proxy server. When a task is broken, how to continue it? Open the broken task, do not modify any patameters, including zoom level, then click start, it will continue. Qweas is providing links to Easy Ovi Maps Downloader 5.54 as a courtesy, and makes no representations regarding Easy Ovi Maps Downloader or any other applications or any information related thereto. Any questions, complaints or claims regarding this application Easy Ovi Maps Downloader 5.54 must be directed to the appropriate software vendor. You may click the publisher link of Easy Ovi Maps Downloader on the top of this page to get more details about the vendor.